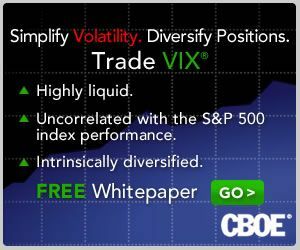 There are many excellent web sites out there that specialize in a small slice of the economic universe, as VIX and More does, and in due time I’d like to think that I will be able to shine some light on most of the better ones. One of the subjects in which NowAndFutures excels is the money supply. Specifically, when the Fed decided back in March 2006 to stop publishing M3 data, NowAndFutures stepped up with their own M3 model and started publishing what they are calling M3b – a very close approximation to the discontinued M3 number. 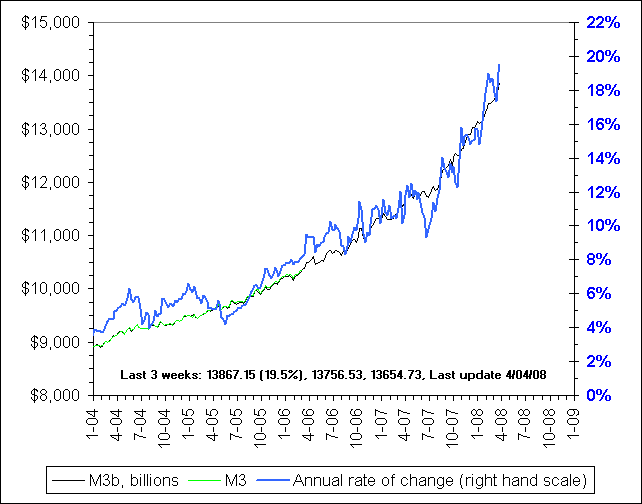 I mention all of this because the recent moves by the Fed to inject liquidity in the system are starting to show up in the money supply data, including the M3b calculation, which is depicted in the NowAndFutures graph below. In some respects, volatility is the opposite of liquidity, so those who are wondering why the VIX has a 21 handle and is trading below the 200 day SMA for the first time in months can look to the recent dramatic expansion of the money supply for a large part of the explanation. This is a subject that completely baffles me. John Hussman over at Hussman Funds makes a pretty good case that money supply is not expanding - that the the TAF and TSIF and Bear bailout create liquidity by swapping good collateral for bad but do not per se increase money supply. To the extent that this swap repairs banks' balance sheets and increases their ability to lend, I can see how M3 might lead to an increase in money in circulation eventually. But with tightening credit standards and increasing risk aversion by borrowers, you have to wonder how much M3 really means. On the other hand, what else could explain the rising cost of all manner of "stuff we need"?